Confidence is an important part of a good trade and therefore we offer the largest range within our specialty “Pumps for aggressive fluids”. 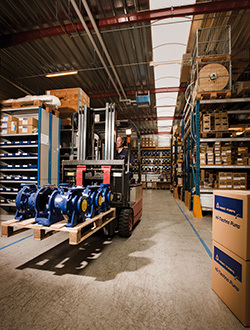 We store more than 600 different pump types at our Nordic warehouse in Hillerød, Denmark.At IWAKI, we stock all wetted parts and components for our process pumps and the complete product portfolio of our metering pumps. Our service personnel are always ready to help with both regular inspections and critical engine stops. We are not satisfied with just selling pumps. We can offer services to help you with all practicalities regarding your new pump. It applies from single delivery and unpacking to the entire installation and configuration of the pump. Our technicians make sure that you always receive the most accurate and optimal setup of your IWAKI products. At IWAKI, we have our own workshop, stockroom and technical staff. Therefore, we can perform any repairs quickly and correctly with original spare parts throughout the pump. We make an effort to secure the necessary spare parts for repairing your pump for many years in the future. Therefore, all wet-end parts and components for discontinued pumps are stored for up to 7 years. If you have a product that cannot be repaired due to missing parts, we will always try to find an alternative solution that you can be satisfied with. If you have questions about pump parts and components or you wish to order spare parts, please contact our office at service@iwaki.dk or by phone at (+45) 4824 2345.